Napa wine tour packages are a brilliant idea because they make your Napa holiday plans easier. The rates, the itineraries, and the activities are fixed so all you have to do is to choose which of the packages suits to your preference and budget. Sure, there are other ways in Napa which let you see the beauty of the Napa Valley, but a hot air balloon ride from Balloons Above the Valley (BATV) is something else, something different! Enjoy uninterrupted, 360-degree views of the Napa Valley as the balloon gently floats up in the sky. Soar over Napa’s famed valleys nestled by several mountain ranges, rolling hills, clean, neat rows of grapevines, as well as estates and family-owned wineries that peak out among the vineyards. Greet the glorious sunrise as you are held in awe and fascination by the expansive views of the idyllic Napa countryside before you. Here’s a look at any of the hot air balloon and wine tour packages from BATV and decide which ones you would like to try! The base package of all the other BATV packages is priced at only $209 per guest. Have a hot and freshly prepared breakfast before the flight that consists of Starbucks coffee and freshly baked pastries from Sweetie Pies. A brief orientation ensues before you and the other guests will be driven off to the hot air balloon launch site… and the ride of your life begins! After the wonderful one-hour sunrise hot air balloon flight, you and the other guests will be treated with a champagne brunch to celebrate the successful airborne journey. This is the perfect package for wine lovers who also crave some adventure! It is similar to the Sunrise Balloon Flight & Brunch — including the pre-flight breakfast and post-flight champagne brunch. However, this package has the additional six-hour tour to four to six premium wineries in Napa aboard the limousine. Experience the time-honored process of wine making, from grapes to glass. The wine tours will then be followed by a buffet-style picnic lunch, in an idyllic setting, at one of the wineries. The beauty of this package is its flexibility. You can opt for the wine tours immediately following your ballooning adventure, or on another day of your choice. This package is a bit more expensive, but definitely worth the cost. This tour package is tailor-made for the convenience of tourists who visit the city but would also like to have a trip to the neighboring Wine Country. No need to drive a car or hire one to take you to Napa Valley because a fleet of limo buses will pick you up from the city. You enjoy an on-board breakfast with mimosa on your trip to Napa and are able to stop and take photos of the iconic Golden Gate Bridge before the wine tour actually starts! Visit the diverse wineries in Napa Valley and Sonoma Valley aboard the luxurious limousine ride. As you hop from one winery to the next one, discover not just the beautiful process of wine-making, but also the delectable differences between the two wine regions. An olive oil tasting is also offered between the wine tours, as well as a buffet-style picnic lunch. 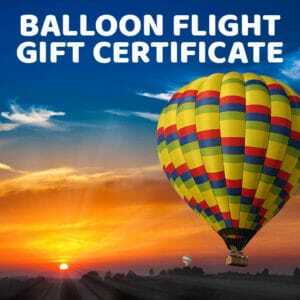 The following day will be your hot air balloon adventure! After that, you will have the option to do some sight-seeing or shopping. If you choose to do so, our chauffeur will drop you off at the Oxbow Public Market or The Napa Valley Premium Outlets before you are driven to the Ferry Terminal in Vallejo. You will take the ferry back to San Francisco. If you otherwise wish to go back to San Francisco right after the champagne brunch, you will be transported to the Ferry Terminal directly. If you plan to be a tourist in San Francisco, then you will not want to miss being a tourist in the beautiful Napa countryside! 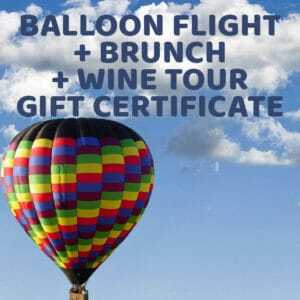 This wonderful two-day package, at $836 per two guests, is guaranteed to satisfy your hankering for wine, charming bucolic Napa landscapes, and of course the hot air balloon adventure of a lifetime. This option is only good for those who don’t want to be a part of the hot air balloon flying party, but would like to follow them from the ground. Follow the balloon from the ground along with our staff. As the flight ends, you will be able to join your party and other guests at the champagne brunch celebration. It costs $40 per chase and brunch, but you can also opt for the just the brunch alone. Please take note that this offer is limited to one person per flying passenger. If you plan to have a hot air balloon ride adventure over the Napa Valley, Balloons Above the Valley has fine tour packages for you to enjoy! Whether you just want to experience the thrill of the hot air balloon ride, or want to do some wine tours in addition to the rides, BATV’s Napa wine tour packages have them for you.